Monna Berryhill the Founder of the Mini Rex Rabbit and NMRRC. 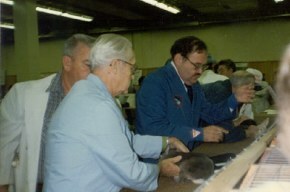 Monna Berryhill from Texas began working on the Mini Rex breed when she won a pair of DWARF REX donated by Marylouise Cowan at the 1984 ARBA Convention in Orlando Florida. A little buck, ZORO, survived and paired with a small Lynx Rex doe named Cotton they produced a litter of 7. There were 3 does in this litter that were kept to become the foundation for the Mini Rex breed. Happy, Bashful and Dopey have long faded from the pedigrees that we see today. Anyone who has been raising Mini Rex since the early years have old pedigrees in their files that can trace back to this beginning. Happy and Bashful were sent to Linda Thompson and Gloria Middleton in Sarasota, Florida. Where they were used to start a breeding program there. Gloria retired from rabbits in 1995 while Linda Thompson continues today with her Southern Belle's Mini Rex. You can find Southern Belles in the pedigrees of the top winning Castors including the first and second Mini Rex to win BIS at an ARBA Convention. 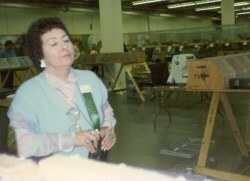 In 1986 at the ARBA Convention in Columbus a very nervous Mona Berryhill presented the Castor Mini Rex . After what seemed like a life time while the Standards Committee made a long careful scrutiny of the animals, they approved the working standard for the Mini Rex rabbit . The cheers rose and tears flowed as we hugged and predicted that this was the breed of the future. 1987 was a busy year for Mini Rex breeders. New varieties were cropping up in litters all over the country due to the Netherland Dwarf influence of the Dwarf Rex. It was not a surprise to find Tortoise, Sable and Smoke Pearl that first year. There were a lot of experiments with small Standard Rex and Mini Rex crosses to improved body type and fur. It wasn't long before there were Chinchilla, Seals, Californian ( now called Himalayan) , Red, White, Blue, Black, Broken, and Chocolate just to name a few. 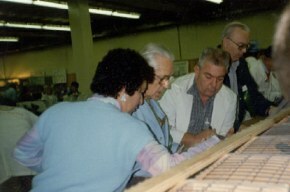 Virginia Minden from California and Bill and Laurie Turner from Arizona volunteered to help in the presentation process for new varieties starting in Portland at the 1987 ARBA Convention.. This was the second year for the breed and the first showing of l5 new varieties. They were: White, Blue, Black, Chinchilla, Seal, Californian, Chocolate and Beige presented by Virginia Minden,. Red presented by Bill and Laurie Turner. Tortoise and Smoke Pearl presented by Linda Thompson. Opal, Broken and Lynx presented by Monna Berryhill. Otter and Sable presented by Gloria Middleton. The Beige, Smoke Pearl, Sable and Otter failed, all others passed with a working standard for their first showing. Madison, Wisconsin was the site of the 1988 ARBA Convention the final showing of the Mini Rex as a new breed and rabbit history. If the Mini Rex were accepted as a breed, the Standards Committee agreed to allow the other varieties presented in Portland to be accepted as recognized varieties provided they passed their presentation at Madison. The Mini Rex became an accepted ARBA breed and history was made !! Not all of the varieties presented were accepted the Blacks and Chocolates would have to wait until Tulsa to try again where they would once again fail in 1989. The process would start over with two different breeders. The 1989 ARBA Convention in Tulsa Oklahoma saw a the first official convention entry of the Mini Rex Breed. Monna and Ken Berryhill took both BOB and BOS with a stunning pair of Castors. It was already evident that this was a breed that was going to rewrite ARBA show history . 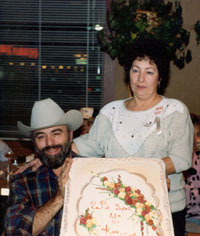 Eric Brennan of Texas took over the Black variety and Freda Kraus from Maryland took over the Chocolate variety. 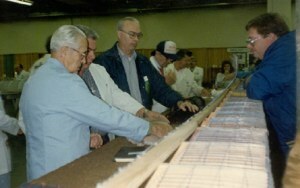 Both the Chocolates and Blacks made a new presentation at the 1990 Convention in Tampa and both passed . The Chocolates successfully completed the process in 1992 at Columbus where it all began. It was here that a Chocolate junior doe from the 1992 presentation was sold in the Mini Rex auction for a record $900. That auction record still stands. The Blacks failed one presentation and finally completed the process in 1993. Today the Black ( both the Solid and Broken) varieties are very strong competitors and have won BOB at Conventions. In 1991 Linda Thompson made the first presentation of the Tricolor Mini Rex in Pomona California, and in 1994 they too were approved. Lilac Mini Rex were first presented by Judy Ball of Virginia in 1992 at Columbus and finally recognized in 1995. 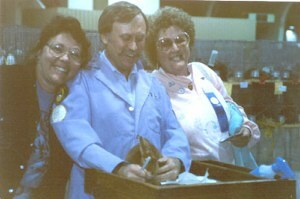 In 1994 and again in 1995 Mini Rex made ARBA history when Anne and Lou Lassen of California took back to back BIS with Castors at ARBA Conventions. In the following year entries of Mini Rex at Conventions are in the top two with entries of 900-1000 Mini Rex . Each year we find Mini Rex in the number one position. for ARBA registrations, Grand Champions and BIS wins . 2005 saw the addition of Blue eyed Mini Rex to the line up. Jan Coffelt's beautiful 2001 Blue Eyed White presentation at the ARBA Convention in San Diego California passed the first showing and only improved for the second showing in 2002. 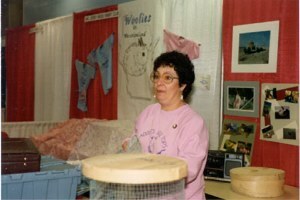 The BEWs passed their third presentation with flying colors in 2004. Joining the ranks of ARBA sanctioned Mini Rex varieties in 2005. 2005 Armando made his third presentation of the Otter Mini Rex in 2005 with resounding success. 2006 the Otter joined the ranks. 2006 ARBA Convention BOB was a Broken Black Otter!!! 2006 The Sable Point was recognized . It takes a lot hard work, devotion and determination to make a successful presentation happen... and a healthy bank account !!! 2010 Linda Thompson lost her battle with cancer, to honor her memory the NMRRC elected to rename the NMRRC Youth Scholarship the Linda Thompson Memorial Scholarship. at the 1988 Mini Rex booth. The Committee continues to look Monna explains. Now we take a look back at some of the original Mini Rex people.